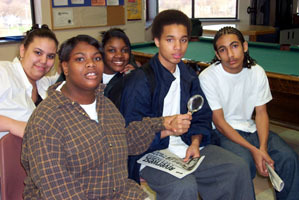 Ask a young person what there is to do in Riverwest and you will get a variety of answers. Playing basketball seems to top the list with “hanging out” being a close second. The days of paper routes and odd jobs seem to be a thing of the past. While most young people will say there is not much to do in Riverwest, a short question and answer session will reveal many things that teen-agers do to occupy themselves. Often, all that is needed for positive activities to happen is some adult supervision and parental guidance. Even though it sometimes doesn’t seem like it, children and teens do enjoy having supervision and guidelines. A person in Wisconsin cannot work until they are old enough (15) to get a work permit. Jobs in Riverwest for youth may seem difficult to find, due to the absence of fast food franchises and large grocery stores, but traditional work for young people such as snowshoveling, lawnmowing, raking, and baby-sitting for neighbors is always an option. For teen-agers to be actively involved in work, though, parents must stress the importance of a strong work ethic early in their children’s lives and guide them to the jobs that will help create that work ethic. Open gym and recreation (daily from 6-7:30pm). Teen Hoop Night (age 11-17): Friday and Saturday nights, 6 — 8 p.m. Teen Employment and Training Program (age 14-17): Tuesday, 6 — 8 p.m.
Adventures in Art (age 11-17): Saturday, 6 — 8 p.m.